Rolling mill, carbon steel / powder-coated steel / wood, black and natural, 11-1/3 x 10-1/4 x 5 inches with (2) 4-1/4 x 2 inch rollers. Sold individually. Item Number: H20-5004TL Have a question about this item? 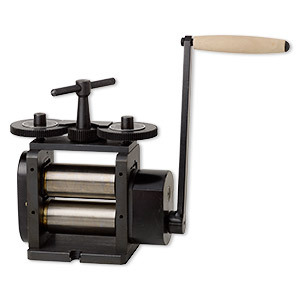 Studio jewelers and metal workers use a hand-powered rolling mill to reduce the thickness of jewelry-making wire and metal sheet or add texture to flat metal pieces. This high-quality, precision-built mill boasts tough, highly polished carbon steel rollers, hardened to approximately 60 HRC (harder than most steel chisels or axe blades). Powder-coated frame for corrosion protection. Short handle takes up little space while 4-to-1 gear ratio provides a highly efficient and smooth operation for consistent, uniform results. Oil when not in use. Oil included.